Neon Genesis Evangelion is one of those series I never bothered to watch because it didn’t look like anything interesting to me. I had never actually seen even a single portion of a single episode, nor did I know what it was about, but artworks I had seen made it look to be a futuristic, space-setting, human-piloted mecha-battling series. In other words, 100% not anything I’d be interested in. I have a long enough list of DVDs to watch which I should be very interested in, but I decided to give a chance to a series I probably wouldn’t normally watch. I decided to let Neon Genesis Evangelion be that series. I remember it was hyped up a lot back when I was in high school, but that doesn’t mean it’s any good. (I also remember everyone pronouncing “Evangelion” with a soft “g”, when the katakana shows it’s a hard “g” — and these were students in my Japanese class!) I’ve also seen more recent news about movies or remakes of some such being in production, and that looked to have a positive response from a solid fanbase. So, why not check it out? My method of trying out a series tends to be: 1) Wait for a box set to be released, 2) Watch for the box set to be sold at a low price, 3) Buy and hope the series is enjoyable enough to watch until the end. There have only been two series so far where I wasn’t sure I’d make it through to the end, one being Piano, the other Michel. Will Neon Genesis Evangelion be a third? There’s only one way for me to find out, and I already have in my hands the Neon Genesis Evangelion “Platinum Collection” and the “End of Evangelion” movie, which a friend recommended I add to my watch list for after finishing the series. 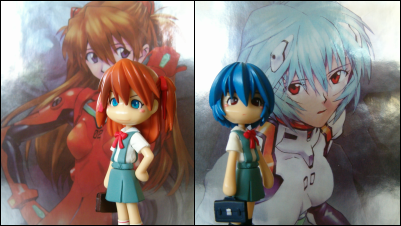 I’ve heard various things about Evangelion as a series, and about Asuka, so now I’ll be able to put it all together. Here’s hoping it isn’t the type of series that turns me away after the first DVD.